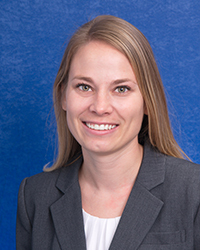 ISE faculty Jennifer Pazour has been selected as a 2016 Early-Career Research Fellow by the Gulf Research Program. Early-Career Research Fellowships recognize professionals at the critical pretenure phase of their careers for exceptional leadership, past performance, and potential for future contributions to improving oil system safety, human health and well being, or environmental protection. These two-year fellowships will be awarded to tenure-track faculty (or equivalent) at colleges, universities, and research institutions. Up to ten Fellows will be selected in 2016.Over its 30-year duration, the Gulf Research Program works to enhance oil system safety and the protection of human health and the environment in the Gulf of Mexico and other U.S. outer continental shelf areas by seeking to improve understanding of the region’s interconnecting human, environmental, and energy systems and fostering application of these insights to benefit Gulf communities, ecosystems, and the Nation.